Article: From thegalloper.com June 2003, with updated photographs. Ghost trains, haunted gold mines and fantasy boat rides have been a mainstay at amusement parks and travelling fairs for as long as any living person can remember. But very little has ever been written about their history and how they have evolved over the years. The history of dark rides is as mysterious as the gloomy space inside them. To me there is something very special about the dark ride. Sitting at the far corner of the amusement park, the fascination is that you just don’t know what lurks inside the dark and dingy building that lies behind the peeling paint of the plywood façade. In some ways, the older and shabbier the better, as it all adds to the experience. Dark rides are all about immersing yourself in another world, whether that world is a haunted castle surrounded by a fog-covered graveyard or a colourful toy workshop. The little car (or boat) guides you through this perfectly timed show, pushing you into the clutches of some giant, hairy spider. You have absolutely no control. And that is the key to the long-lasting appeal of the dark ride. I remember watching a Channel 4 documentary about trains (of the steam – not the ghost – variety) a few years ago, narrated by John Peel. The reason I watched it was solely because I knew it was briefly going behind the scenes of the Ghost Train at Rhyl’s Ocean Beach Amusement Park. The cameras took the viewer behind the faded façade into seemingly miles of twisting, turning track. Inside were the usual assortment of crumbling papier mache monsters and illuminated skeletons dangling from ceilings behind chicken wire. John Peel noted that the entire twisting, turning track was inside a building no bigger than the typical suburban bungalow. And he is right; most dark rides at British amusement parks (with a few notable exceptions) would fit into your typical 3-bedroom bungalow. In fact, many travelling ghost trains in this country do literally fit inside the back of a lorry, despite the fact that they have facades that suggest that you are entering a building the size of a typical Tesco supermarket. Many dark rides at Britain’s amusement parks also fall firmly in the category of being ‘vintage’ rides. And most were self-built by the park in question, meaning that there is no ‘typical’ dark ride. Overlooked they may be, but they are certainly worth a closer look. Here, then, is my potted history of the dark ride. So take our seat, keep your hands in the car at all times and – remember – you might just be scared out of your wits! The dark ride has been a mainstay of amusement parks and travelling fairs for over 100 years. The history of ghost trains in the UK can be traced back to the travelling fairground shows of the 1800s. In the days before thrilling rides, travelling fairs were primarily about shows - freak shows, waxworks and theatrical booths - and the ghost train takes its roots from this tradition. By the mid-1800s, Ghost Shows (theatrical productions, which often took place in booths on the fairground) were a major part of the travelling fairground scene. The development of the ghost train in the last century can be linked to these 19th Century shows. Ghost trains are merely an extension of the fairground ghost show concept to allow the new-found technologies of the last hundred years to turn the show into a ride and add a whole new dimension of movement to the experience. In more recent years, however, the ghost show has expanded to include themed fantasy rides and rides which take passengers on journeys around the globe. The earliest dark rides were pioneered simultaneously in the UK and the US. 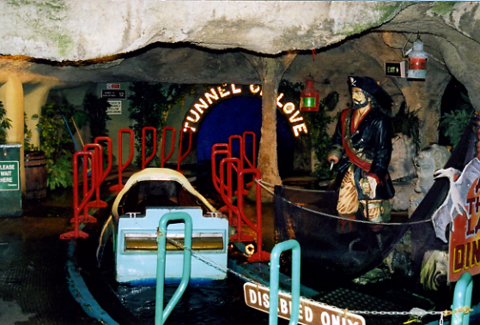 The ‘tunnels of love’ or ‘river caves’ were the earliest form of dark ride. These slow-moving boats took riders on a romantic tour of far-flung places around the world. In the UK, the modern amusement park dark ride can be traced back to Blackpool Pleasure Beach, which itself had borrowed ideas from the huge exhibitions that were once held in the UK. The Pleasure Beach had installed the River Caves in 1910 and this was a rebuild of the river caves ride at London’s Earl’s Court Exhibition of 1909. This must have been a particularly awe-inspiring ride in the days when even Blackpool itself was considered to be an exotic destination by most people in Britain. Even to this day, this ride impresses. In the late 1920s, always looking to install the latest thrill from the USA, the Pleasure Beach decided to borrow one of the big hits from across the pond. The early part of the last century saw a boom in dark ride construction in the USA. These ‘pretzel rides’, as they were called, were named after the Pretzel Company that made many of these dark rides. The Pleasure Beach decided to build their own pretzel ride. 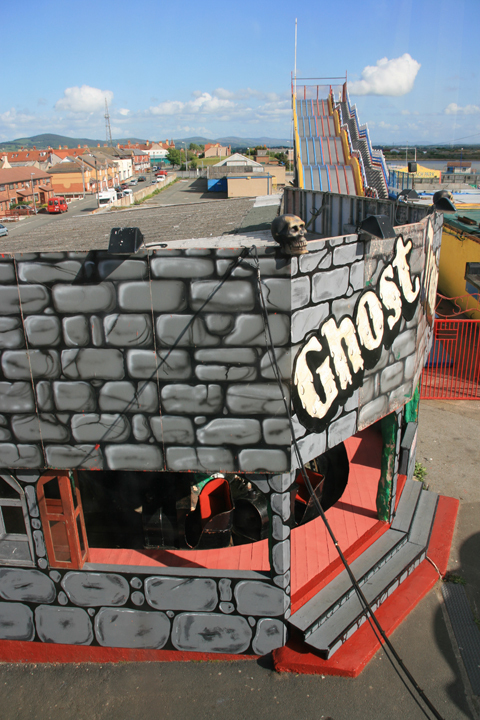 As the name Pretzel was little known in the country and didn’t give much of a clue as to the ride itself, the park adopted the name ‘Ghost Train’, which was taken from a popular stage show of the time. 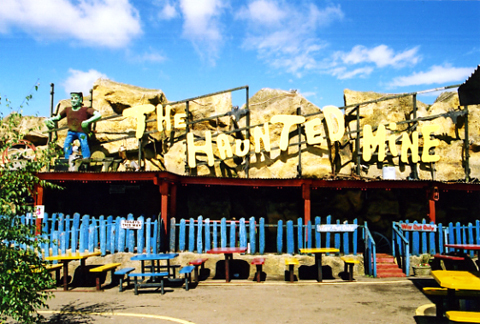 The name stuck, and has been adopted as the generic name for this type of dark ride in amusement parks and travelling fairs across the United Kingdom, and still continues to be used to the present day. Following the opening of Blackpool Pleasure Beach’s huge Ghost Train ride (opening year 1930), other major amusement parks installed similar rides: Dreamland (Margate), Pleasure Beach (Great Yarmouth) and Pleasureland (Southport) all had their own dark rides. Even holiday camp king Billy Butlin installed ghost trains in each of his chain of seaside amusement parks. In 1936, Blackpool Pleasure Beach decided to install a larger ghost train and commissioned architect Joseph Emberton (the man behind the Casino building, Grand National station and Fun House, amongst other iconic Pleasure Beach structures) to design it. It had a hugely impressive frontage, opening up into what could only be described as a giant stage set, complete with roller coaster-style drop in the centre. The main ‘stage’ was flanked on either side by balconies, which served to add an extra moment of excitement for the riders and show park visitors that this ride was not only on one level, but two. The roller coaster-style drop has since been employed on many other ghost trains, including rides at Bridlington, Walton Pier, Dymchurch, Brean Leisure Park and, until recently, Morecambe and Brighton. 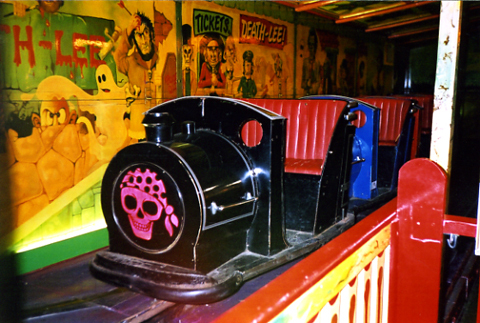 (Morecambe’s ghost train closed at the end of the 1999 season, but part of the ride system was resurrected at Brean Leisure Park. Brighton Pier’s ghost train was destroyed by fire in early 2003). The first floor balconies are also much copied. Ghost trains also became hugely popular in the travelling fairs in the 1940s and 1950s. These rides were basically buildings that were built up from scratch, and required a large team of people to construct them. By the 1960s and 1970s, showmen were looking for rides that could be built up more quickly, and that really marked the end of the great travelling ghost train. More recent years have seen a revival in the travelling ghost train. But the quest to make rides easier to build up and pull down has meant that most are now lorry or trailer mounted (i.e. the entire ride sits in the “back of a lorry”), so they are limited by space. The lack of a large amount of interior space has been offset somewhat by the huge foldout flash sported by many rides, which are often on several levels. A typical early British travelling ghost train can be found at Folly Farm (Begelly, South Wales). On the continent, things are very different. 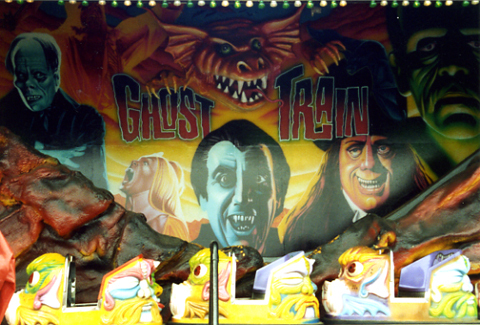 Large ghost trains and other dark rides, many comparable to British amusement park ghost trains, are travelled, and require a small army of men to build up and pull down. Dark rides have continued to develop over the past few decades. 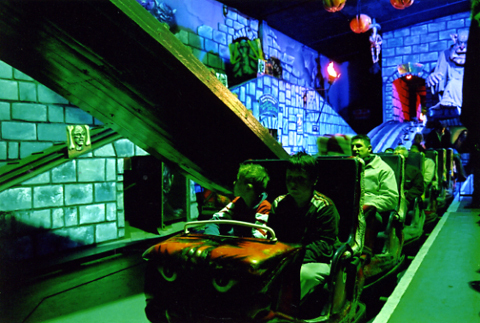 The 1990s saw a mini-boom in water-based dark rides. This was started by Professor Burp’s Bubbleworks at Chessington World of Adventures, which has spawned many a copy. The turn of the Century saw the construction in the UK of what many consider to be the most spectacular dark ride of them all – Valhalla at Blackpool Pleasure Beach. And it is fitting that this ride should be built at what is undoubtedly the home of the dark ride. This new ride flips the idea of the river caves on its head. The boat is no longer merely a means of transportation – it is part of the thrill of the ride, with fast drops (one taken in reverse), and spectacular special effects, involving wind, fire, ice and lightning. The ride really does take the breath away. But the new millennium has seen a worrying trend. The current fad for TV interior design and garden makeover shows has spilt over into the dark ride world and now we have – yes - dark ride makeovers. Perfectly good dark rides are being ripped apart, the trains equipped with ‘laser guns’ for interactive shoot-out rides. Maybe I am getting old, but this concept really goes against the whole point of the dark ride. As I said above, the dark ride is all about immersing yourself in another world; the car is in control – you are a helpless passenger. With shootouts, the rider is now in control, and the ghost train simply becomes a large arcade game. How can you be frightened of ghosts if you are armed with a gun? Excellent dark rides at Chessington World of Adventures and Alton Towers have already been lost to these makeovers. There are many interesting dark rides in this country that are well worth checking out. I can recommend the following: Haunted Mine (Barry Island Pleasure Park, Barry Island); Ghost Train (Bayside Fun Park, Bridlington); Ghost Train, River Caves, Gold Mine, Alice’s Wonderland, Magic Mountain, Valhalla (Blackpool Pleasure Beach); Ghost Train (Botton’s Pleasure Beach, Skegness); Terror Castle (Brean Leisure Park, Brean Sands); Professor Burp’s Bubbleworks (Chessington World of Adventures); Ghost Train (Coney Beach Amusement Park, Porthcawl); Terror Train (Coral Island, Blackpool); Pirate Adventure (Drayton Manor, Tamworth); Ghost Train (Funland, Pwllheli); Haunted Hotel (Pleasure Beach, Great Yarmouth); Ghost Train (MW’s Amusement Park, Dymchurch); Voodoo Mansion (Oakwood, Narberth); Ghost Train, Haunted Silver Mine (Ocean Beach Fun Fair, Rhyl); Ghost Train and River Caves (Pleasureland, Southport). The above list only scratches the surface of dark rides in the UK. Be warned: you will find a dark ride lurking in the corner of just about every amusement park in the country and most are worth a ride. But please contact me if you see Carol Smillie and her makeover team anywhere near one! Thank you for a nostalgic look at the old "dark rides". I live in Australia and have been trying to garner information on Drive Systems and layouts for "Ghost Train" style rides. It never ceases to amaze me how small the actual footprint of the rides is in reality...it seems as though you are travelling for miles once you get "in the dark" so to speak. I empathise with you about the "modernisation" of the dark rides as well, but I suppose it's all about "bums on seats"! Do you have something to say about this article or perhaps some additional information? Please email us! (Please note that any comments or information sent may be edited prior to posting here). Nick is a Chartered Town Planner and Director at the UK's largest planning consultancy. 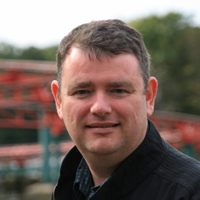 He works extensively within the visitor attractions industry, advising many amusement and theme park operators on planning and development matters. He also advises several casino operators and is involved in a large number of seaside regeneration projects. His clients also include a number of major blue chip developers. Nick founded the Save Dreamland Campaign, which campaigned to save Margate's Dreamland Amusement Parks. He is Chairman of The Dreamland Trust, which is building the world's first amusement park of historic rides at Dreamland Margate and owner of Fairytale Farm, a new attraction aimed at children with disabilities. He has written articles for a number of newspapers and journals and regularly speaks at conferences on the subject of planning for tourism and leisure. His 2006 book, Pennies by the Sea, provides an insight into the world of amusement arcades. Nick is also editor of the web site www.joylandbooks.com.